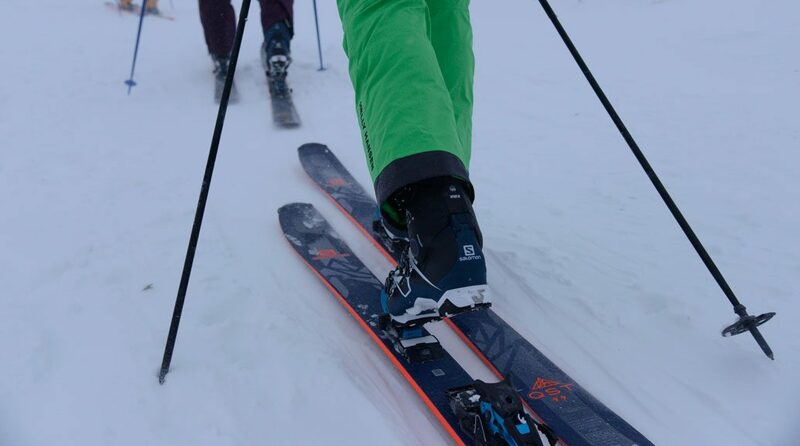 There has been a lot of press about the new S/Lab Shift ski binding from Salomon. After nearly a decade of R&D Salomon has produced a ski binding that can deliver downhill performance with touring capability. A ski binding that gives today’s freeride skiers a chance to “earn their turns” by touring uphill and then charging ‘big lines’ on the descent! Salomon can tell you all about the ski bindings here; and, as previously mentioned, the freeride peak hunting athletes’ are screaming “Holy Shift”. But what does a novice, rookie, greenhorn, virgin ski tourer think of the Shift ski bindings? Well read on. Having never ski toured before I was both excited and apprehensive when Shep, Salomon’s friendly ski tour guide, introduced me to ski touring. First the safety kit, including a transceiver which was very reassuring. And then the 99mm underfoot QST skis with S/Lab Shift bindings, and skins. All I will say is; “if you are into Transformers you’ll love these bindings”. A ‘click here’ and a ‘click there’; and you transform a touring binding into an alpine binding, and visa versa – “simples”. It was cold, windy, and in cloud; which gave my first experience of Sweden a rather ‘monochromatic’ outlook. So with the skins attached and the bindings in touring mode, I managed to locate my boots securely. It takes a bit of practice, but I would have experienced that with any ‘pin binding’ – and you soon get the ‘knack’! We set off, nothing too adventurous at the side of the piste, but enough to understand the technique of going uphill with skis – without the aid of a button or chair lift. Needless to say it was more tiring, but it was also more rewarding – I now understand the term “earn your turns”. It was now time to, ‘click here’ and ‘click there’, and transform the bindings into alpine mode. This I am familiar with, and they felt as good as the bindings I have had on any of my piste/all-mountain skis! The whole experience was great, and I managed to impress Shep enough to allow me to join a more adventurous trip the following day. 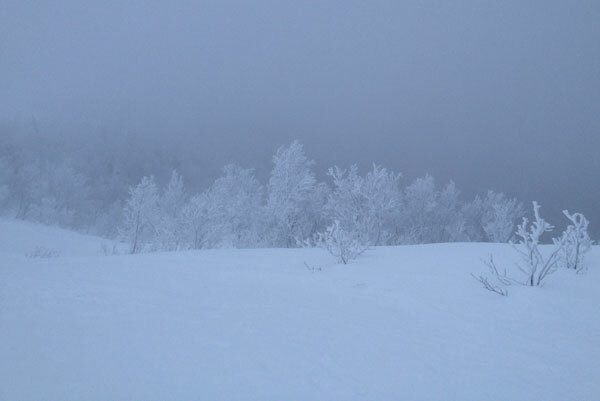 Again it was cold, windy, and in cloud; which gave my first experience of Sweden a rather ‘monochromatic’ outlook. We skinned up much steeper terrain, with a customary ‘zig-zag’, and once again the bindings performed brilliantly in touring mode. Once again the pleasure of being away-from-the-crowds, that ski touring gives you, was delightful. But as Sir Isaac Newton eloquently said; “what goes up must come down”! I felt sorry for the trees, as we descended the powder fresh tree line. A twig here, a branch there; we became close friends. 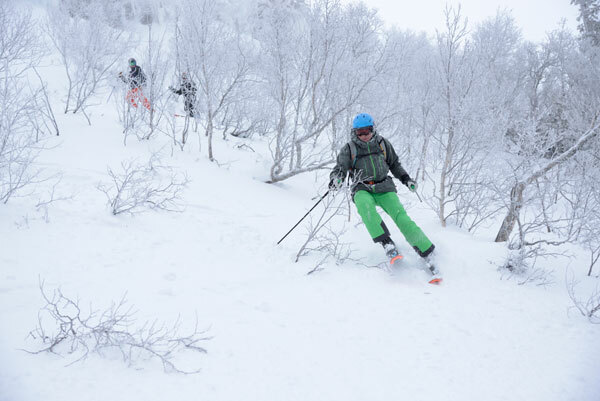 If you have read my review of the Salomon XDR skis, you will know I’m not the most proficient off-piste skier; so with a ‘click here’ and a ‘click there’ I was ready to venture “outside my comfort zone”! I felt sorry for the trees, as we descended the powder fresh tree line. A twig here, a branch there; we became close friends. Too close sometimes; but the bindings, in alpine mode, released with great aplomb! At the bottom it occurred to me, that while my colleagues made light-work of the tree line, it was I that was fully testing the bindings – as I ‘crashed’ my way down! So what does a virgin ski tourer think of the Salomon S/Lab Shift ski bindings? Rather amazing actually! Here’s a binding that will perform in both alpine and touring mode; and will enable you to ‘earn your turns’ however extreme they may be!